Tri-Art’s 100% acrylic gesso has superior covering power and flexibility. It dries to a matte black finish which can be easily sanded to provide a smoother ground. Combine black and white gessos to create intermediate shades. To create a more textured ground, combine it with Tri-Art Modeling Paste until the desired effect is achieved. 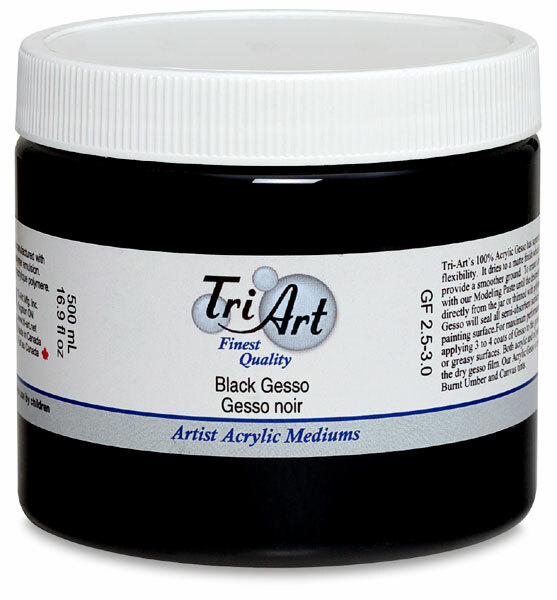 Applied directly from the jar or thinned with polymer medium or water, Tri-Art Gesso will seal all semi-absorbent surfaces, while creating a neutral painting surface. For maximum performance, apply three to four coats of Gesso to the ground. Do not apply acrylic gesso to oily or greasy surfaces. Both acrylic and oil paints will adhere to the dry gesso film. When using an acrylic gesso with oil-based or alkyd paints, be extra careful that the surface is dry and fully cured. Tri-Art mediums have been formulated to provide artists with an endless range of textures, effects, and finishes. Tri-Art Polymer Mediums have a similar consistency to Tri-Art Liquid Acrylic paint - the ideal medium for extending color and creating rich glazes. Tri-Art Modeling paste provides a high relief textured ground that can even be sanded or carved! Tri-Art Gessos are smooth, flexible, sand-able and absorbent. 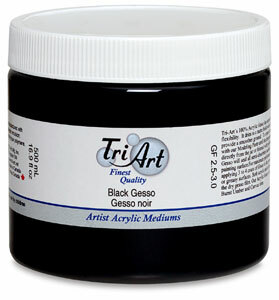 Tri-Art Sludge Gesso is the most economical and ecological gesso while providing an opaque and flexible ground. Tri-Art Top Coat Hard is designed as a non-removable final coat for rigid supports. It dries glass clear to a tough, scratch resistant, glossy finish.